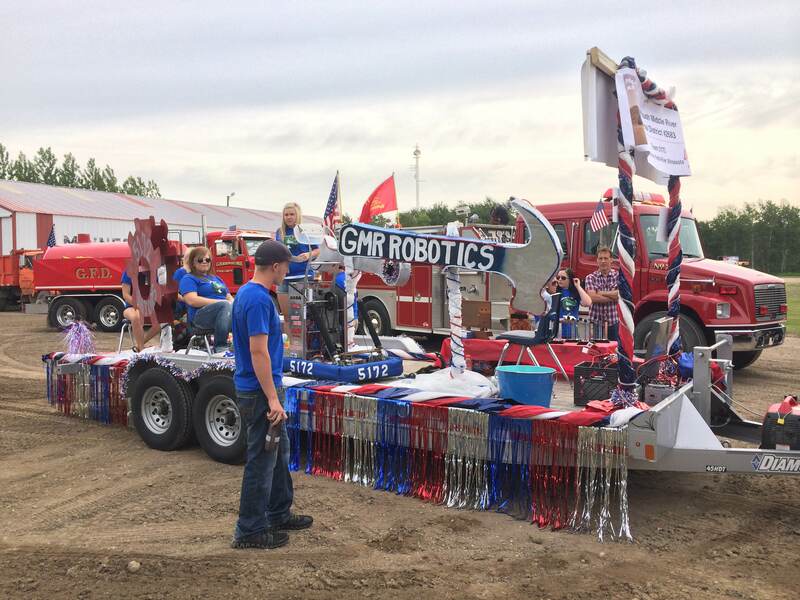 Last Friday the Gators showed off their robot on their 1st ever 4th of July Float in the Greenbush parade! It was a whole lot of fun for all of us; we even got to be the Grand Marshal! 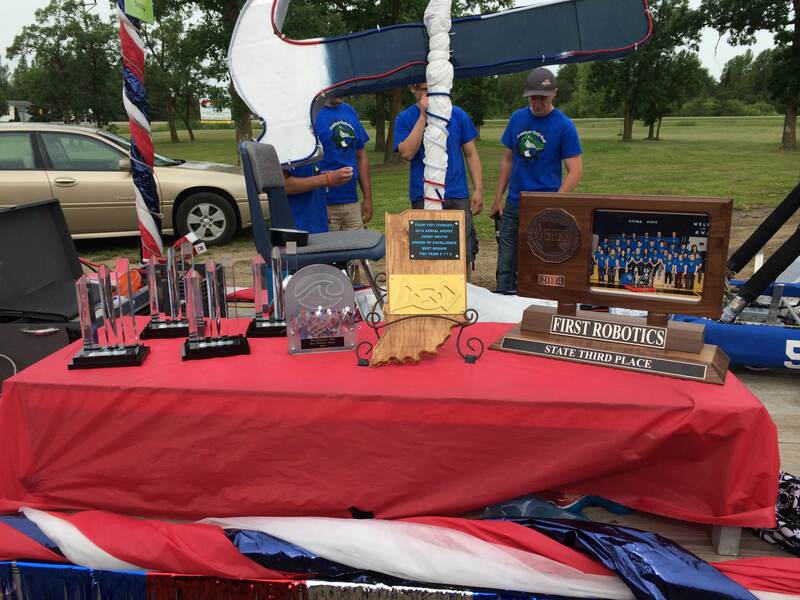 On the week prior to the 4th, a group of Robotics team members got together in the evenings to construct the float, which consisted of a display featuring this season’s trophies, giant 3D tools (made out of cardboard,) banners embellished with red, white, and blue lights; and of course, Triplex (our robot.) In the end, we thought it looked great! 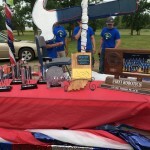 Unfortunately, despite our hard work, the float failed to win us any awards at the parade. It’s okay though, because our team has many, many more years of 4th of July parades to attend. 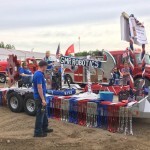 While designing the float we had to decide whether we would have the robot on board the trailer to show off it’s Aerial Assist skills or on the street driving around. 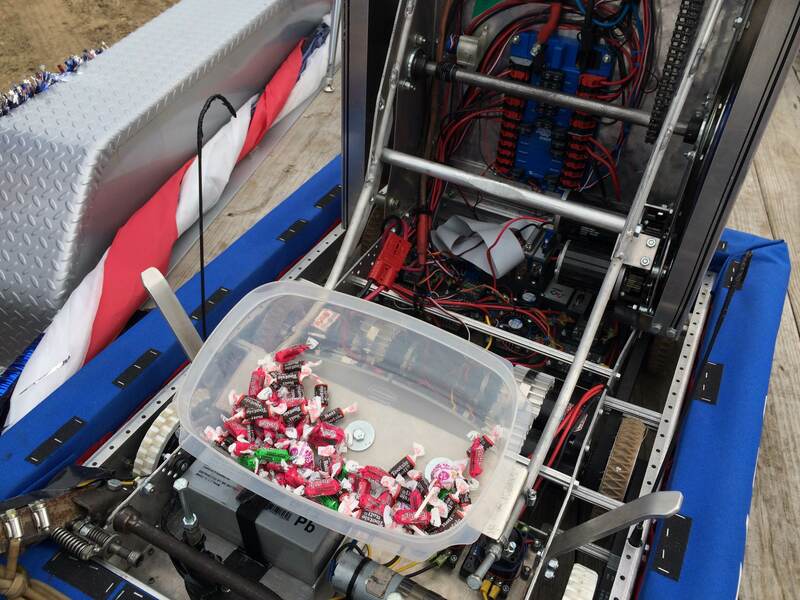 We thought about what we could do with a throwing robot in a 4th of July parade and the answer was unanimous: Triplex was going to throw candy! The build and program team set to the task of rigging the catapult to gently toss candy onto the street without enucleating innocent bystanders’ eyes. 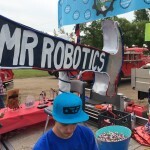 In the end we had a candy-throwing robot, which turned out to be a dream-come true for many children watching the parade. While driving the robot through the streets, I couldn’t help but hear comments such as “This is the best thing in the world!” or “Wow, that is so cool! 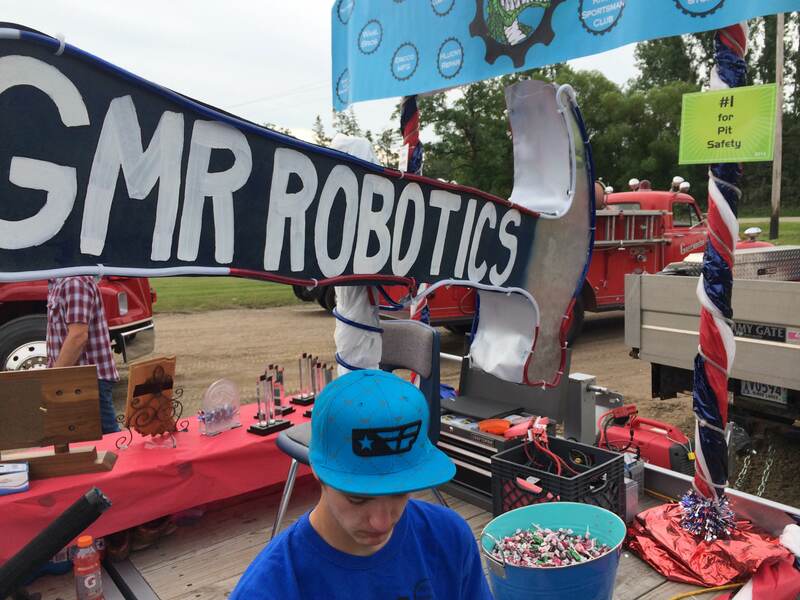 That robot threw candy!” It was fun being able to make so many people happy. Later in the afternoon our team put on a demonstration at the fire hall. Everything went smoothly and we did a good job of making our name known in the community. We tried to spark interest in the younger kids by allowing them to try driving the robot and shooting goals; they seemed to really enjoy it! 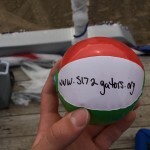 So where are the Gators off to next this summer? That seems to be the question; so far all we have planned is a demonstration at the Greenbush Nursing Home and some website/programming training sessions. We would all love to have the opportunity to participate in an off-season event, so we are currently looking into that. This is one of the 3D objects we made for the float. 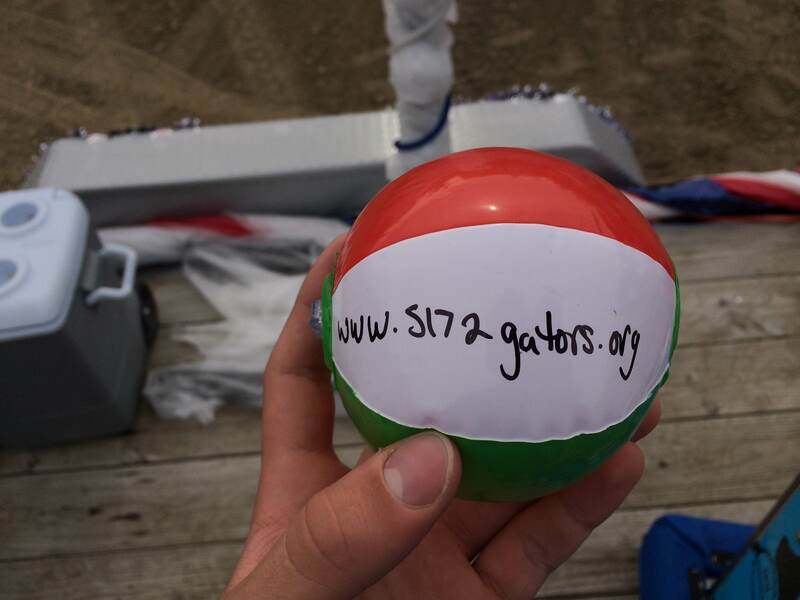 We threw these balls throughout the parade to advertise our new website. Triplex with its candy bucket! This is the display we created to show off our awesome awards! This is our 4th of July float!